Q: Aaron, do you have a favorite game or game-time moment? I would say pre-game was really amazing to me when we said the team prayer. And it was unbelievable running out of the tunnel into Memorial Stadium with 76,000 people and you just heard that roar. (imitates roar) I grew up playing in my backyard on Saturday afternoons when I was a kid and hearing that roar since we only lived three miles from the stadium. So the pre-game prayer, entering the stadium to that roar, and when you did get in, it was so surreal. Just so amazing. Overall, taking it all in was pretty cool. AD: You know, the receivers were pretty laid back cats, but then we’d all be in there saying the team prayer and we’d start getting hyped up, “..a team that won’t be beat…” and even more hyped up, “..can’t be beat! Rahhhhh!” After that we were just ready to jump out of our uniforms. And the words to that prayer were pretty cool, “Day by day, we get better and better. A team that won’t be beat, can’t be beat!” And then we’d go out there with the mindset that, “We won’t be beat,” because we had that mentality, “You won’t beat us.” Because when you have that mentality and the opposition sees that drive and they know they can’t beat you, it’s a pretty fun Saturday. When you can take the will from a person to win, it’s a pretty fun day. Q: In that process of taking the will to win away from a team, was there a certain threshold where it seemed most guys would lose that will? AD: About third quarter. (laughs) Sometimes earlier than that. Once you hit a defensive back over and over and over and over in the legs, every play, no matter what the play is, he is going to lose the ability to fight, he is going to lose the will to fight. A perfect example of that is when Cory Schlesinger scored on those plays down in Miami. You notice those defensive backs down in Miami -of course you noticed Cory’s thighs and that power- but their legs had nothing left. They couldn’t take him down. First of all, they’d get kneed in the helmet like Roger Craig would do. But physically they had nothing left in the tank. When someone keeps taking their legs out over and over again, that’s the base of your power! From your time in the weightroom, Paul, it all comes from the legs. You can have the greatest bench press in the world, but if you have no power and explosion in those legs anymore, you’re done. You don’t tackle with your arms, you tackle with your legs. Q: I was gonna say that without Abdul blocking, Cory wouldn’t have been in the end zone on that first one, would’ve he? AD: You’ve got that right. Exactly. He took the guy’s legs out, he chopped him down, man. And we always had a ton of receivers going in and always stayed fresh, as well. So if you had a defensive back getting hit over and over and over, he wasn’t as fresh as he was in the first or second quarter anymore, he had no legs left. Q: They knew they’d played Nebraska the next day? AD: They knew it for the next month. (laughs) In fact, they’d be out there doing warm-ups the next week for the next game and still feel it from playing Nebraska. Q: Do you have occasion to run into guys who played against us those years? So the thing that was relevant for both of them was that they both knew they played Nebraska. Regardless of the side you were on, you knew you were going to feel the intensity and the pressure of Nebraska. Q: Do you have any memorable off-field remembrances? AD: Some you might not put in a book. (laughs) Jacques Allen…. Jacques, I‘ll never forget how Jacques used to have Coach Osborne laughing. Jacques was just a funny dude, he could make everybody laugh. He was one of my scout team buddies and I remember when Jacques would catch a pass on scout team. It didn’t matter if we were forty yards out, Jacques would run it all the way to the end zone for the score. Charlie used to crack up laughing at him. And he’d always keep us cracking up on scout team, that’s just how he was, and he’d always have us in stitches. Another thing, off the field, I remember one time in meetings Coach Osborne fell over in his chair. (laughs) And Damon Benning always used to play tricks on Coach Osborne. We were in team meetings, the offensive meeting, and the lights were out. And Coach went to sit down and all of a sudden all you heard was, “Whooooaaaaa!” (laughs) Then you heard, “Damon, I’m gonna get you!” That was a good one, man. AD: Oh yeah, that’s when we all lived together. Me, Tommie, Tyrone and Barron Miles. It was on 3923 Madison Street, I remember, over by Wesleyan and East Campus. I wasn’t home at the time. It was summer and I was at class and never saw it happen when they put out the fire, but there were many things like that that went on. That was a good one there, though. Q: One can obviously see that in the profession that you’re now engaged in, that you’ve drawn on a lot of those experiences to make points about the process of achievement and success. Let me ask you, is there one watershed moment or outstanding experience that really crystallized something for you? AD: Man, Paul, there are so many, it’s so hard to just pick one. I will say one thing, and it’s going to sound cliché, but it’s true: I would probably say it’s the importance of fundamentals. I share that with companies all the time. And the fact about corporate America? Many of them don’t know what they are. There are three things you should be doing every single day, and the companies I work with, we call them HPA’s: High Payoff Activities. If you’re in sales, you have got be making calls every day, following up every day. And a lot of salespeople never follow up. As receivers, every single day we ran routes. Every. Single. Day. And other positions had their activities, too, but we as receivers ran routes, we caught passes, and we blocked. Every single day. It didn’t matter if we practiced outside, if it was 20 degrees or 100 degrees, we did that every single day. Those were our fundamentals every single day. You ran routes, you caught the ball and you blocked. The margin of error is so small at that level, as you know. If you round off your route, just shave it off a little bit in that league, they’ll pick it off if they can get their hands on it. And you ran routes with precision. If it was a 10 yard route, doggone it, it better not be nine and it better not be eleven. It had to be 10 yards. And those were our fundamentals every day. Every single day you have to do those things. And that has taught me a lot in my business. In my business, Paul, every single day I’m writing, I’m following up with clients that I’ve dealt with and measuring how things are going, and I’m constantly reading. I’m reading about my industry every day, writing about my industry every day and I’m following up and making calls. Those are my three fundamentals. Those are my route running, catching and blocking every day. Those are things you have to do every day, and every field has those fundamentals. The sad thing is, in the corporate world a lot of people don’t know what those things are, so they find themselves doing about 30 things every day. And really only three of them are the fundamentals they should be doing. But that’s what’s helped me out as a businessman. There are other things, but it’s the fundamentals. The same goes with my personal life. Those fundamentals. You know, football is so synonymous with life if we just utilize those things. The biggest thing for me is those fundamentals right here, that I learned at Nebraska. Q: So thinking back, what do you value the most? The rings, the relationships? AD: Oh, that’s easy. The relationships. The memories. You can take the rings. As a matter of fact, I had two of them stolen. I was in a Dallas hotel and they were taken by one of the maids. But I got those back. And you can take the rings all you want, but the memories and the relationships, those are mine. You can’t take those away. The rings and all that are nice, but you’ll never take away the experience I had there. Never ever. Q: Nicely put, Aaron. And was there anyone behind the scenes the typical fan might not have been aware of who really played a huge role for the team, who made a big difference, maybe made the difference to our success at that time? AD: Oh, I’m gonna say this -and not just because you’re on the phone talking to me- but it was the weight room. With you and those other strength coaches, that’s where it starts. To physically become stronger and dominate people physically, the weight room was the place where you went to improve, it’s where boys came to become men. That was where you established a work ethic, and the weight room was the place where you did it. And that’s why it was glorified all those years, why it stood out head and shoulders above the rest with all the sweat and time and resources that you and your guys put into that. The research and the development, that’s why a lot of kids wanted to go to Nebraska, man. It was the weight room. They wanted to work out there in order to get on the field. It was crucial, the things you guys did. The conditioning. That’s why we beat these teams, we were better conditioned than probably 95% of the teams out there. That’s why we won so much. And other teams had more talent than we did. Though you can have all the talent you want, but if they’re tired the talent dissipates pretty quickly. We were just in better shape. That was the reality of it: we could hit you longer and harder and faster than the average team because we paid the price in that weight room. But also, there’s the academic center people, too. The Hewitt Center team. 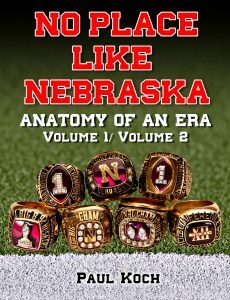 There’s a reason why we have so many Academic All-Americans at Nebraska and our graduation rate is so high. It’s because of that academic center, the Hewitt Center. When those coaches were recruiting in your living room they always preached academics first and football second. That was in the culture, the DNA of the program, you know? “Your kid will leave here with a degree if we have anything to do with it. We will push that young man in every way to get that degree.” The way it was done, in the right manner, the legal manner, within the rules. That’s why we’ve never gotten any sanctions by the NCAA, because we did things right during that time there. They stressed the importance of academics around the clock. And then you have to take a look at the places we did this stuff and sometimes they get left out, but what about the facilities team? We had the top facilities because of Shep and those guys. Grass was always watered and manicured, the place was always so clean and presentable. The equipment managers, setting all the stuff up with the proper equipment out there. You’d always see the team picture, but that was only half the team. You had all these people behind us doing their jobs, giving us all the resources that we needed every week and every year. There was a lot of people who had a lot to do with that. The cooks, the nutritionist over there in the training table. All those people get forgotten about by the overall public, but we and the coaches know that those people shouldn’t be forgotten. The strength staff, the academic team, the facilities team, the training table team, the administrative team: these people were all working behind the scenes to make sure our planes were scheduled and our hotel rooms were okay whenever we traveled. All those things that people tend to forget, they played a huge part in what went on there. Q: And of all those people, is there one person who stands out to you the most? Q: Doak always knew what was going on, didn’t he? AD: He knew everything. I’d go, ‘Doak, how do you know this? !’ There were things you didn’t want him to know about. I see Doak to this day, he’s a guy who’d be taping your ankles and visiting with you at the same time, “A.D. be careful about this. Look out for this.” He had his ears out because he cared about you and was looking out for you. ”Stay away from this situation. Don’t go near this crowd.” That type of thing. He wasn’t out there throwing your business in the streets, he kept it to himself. But if you asked, he’d tell you what was the thing to do. And all you guys were. It was a culture where it was a family, and that’s the part you appreciate. That’s one of the powerful and peculiar things about Nebraska Football fans: even if Aaron only got into the games and played with 55 seconds left on the clock, people would still remember him. Why? Because they rarely ever left before the game was over. Hardly ever. Oh sure, some would abandon their seats and start to make their way to the exits, but it was only at a slow, deliberate, protracted crawl, attempting to perfectly time the elapse of the play-clock to their final dip into the Memorial Stadium’s dark underbelly and subsequent exit through its ornate gates. Some great, future Husker star could have been among that group of young scrubs picking up the scraps of playing time, so you didn’t want to cheat yourself out of a glimpse of future greatness. And The Tom Osborne Show wrapped up at 11 p.m. on Sunday night, but sometimes the old eyelids just couldn’t hold up for one last minute, making a person miss a precious video highlight or two. A fan had to “make hay while the sun shined,” like they say on the farm, so they milked their ticket for all its worth. 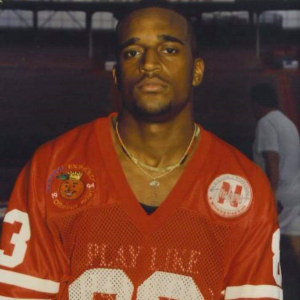 We don’t hear much talk of it in today’s popular culture, but as a member of Ron Brown’s receivers it was preached non-stop, “There was a culture of excellence, a culture of high expectations, a culture that mediocrity would not be tolerated… there was a way to get things done. You were not only accountable to your coaches, but you were accountable to your teammates. So there was accountability on all levels.” Growing out of the Unity Council and answering to position coaches while fighting to stay atop the depth chart, accountability both individually and collectively was pervasive. There was always someone watching: a staffer, a teammate, a fellow student, the media, even a young fan. One small slip-up or failure to abide by the code that comprised the concept of team and a disavowal of the caring and, dare I say, love, that was shown the young men was a most egregious mis-step. Funny, but Aaron was correct when he stated that, “You’d always see the team picture, but that was only half the team. You had all these people behind us doing their jobs, giving us all the resources that we needed every week and every year.” The last thing you wanted was to let these people down. Reaching for excellence and achieving it was infectious, and as a player you wanted to spread this virus and leave a legacy for others to follow and emulate. Aaron’s fellow receiver teammate Clester Johnson once remarked, “We had this drill called ‘Make me a man, Coach.’ That’s when Coach Brown would throw the ball as hard as he can from just five feet away. It was wonderful, that type of tenacity, that type of go after it-ness…” “Make me a man, Coach.” This, the staff’s overriding goal, was addressed at every possible turn, because if it ever got to a fourth and goal with one more snap of the ball left to play out, you wanted to be the sideline with the ‘men’ capable of whipping the ‘boys’ across the scrimmage line.”So it was like they said, “Hey, I have five years to develop this young man to the best of my ability. And after five years he goes away.“ So for them it seemed like they had a sense of urgency.” From our many conversations, I happen to think the coaching staff achieved quite a bit in those precious but all-too-quick five years. A sense of urgency helped. 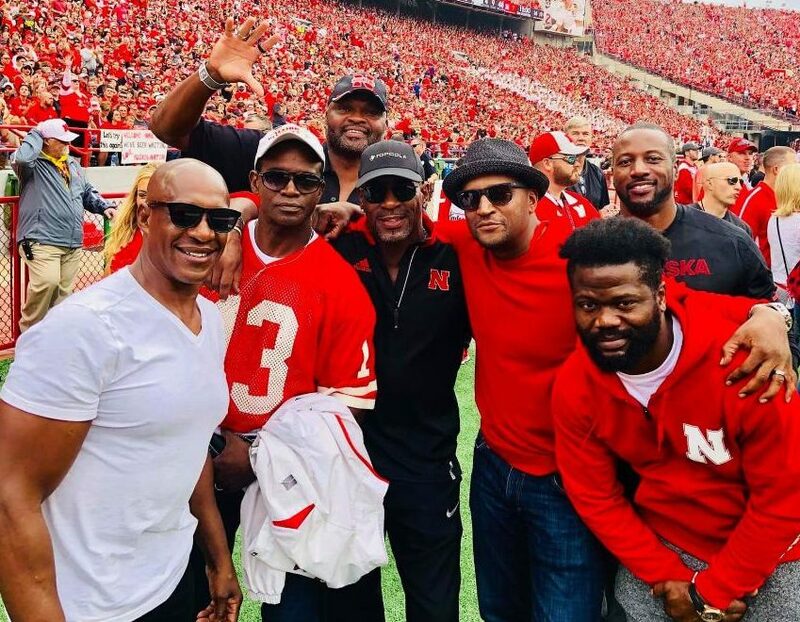 Last, “representing more than a million people in that state that had supported that program and loved that program so much… you didn’t take that lightly… That’s one reason the name ‘Nebraska’ resonates around the country.” Once again, it comes around full-circle to the unique inter-relationship with the supporters in scarlet, the legends of lore, the familiar fanatics and family and friends. Seeking to please, to instill pride, to inspire, to elevate their talents and to match man’s highest athletic ideal, his farrest-reaching feats, the sound of that resounding red gameday roar drove them to scale points unknown and into the history books.